Front Page > Swindon Life > Getting More Children in Sport! Would you like your children to be involved in a sport which will help them make friends, build confidence and self-esteem, learn new skills and create aspirations for the future? Something progressive and educational in which they can grow and develop, that is also good for their health and above all, great fun? You may think horse-riding can be expensive or even an elitist sport but Hoof Club CIC (Community Interest Company), not-for-profit, at Rein & Shine Riding Centre is making it accessible to everyone. With a wide range of learning and tuition programs, courses and lessons, your child will be part of a fun club that caters to all their learning needs. Thanks to £68,000 in lottery funding from Sport England, Hoof Club is extending its facilities and is now taking on more members. Hoof Club applies to everyone, regardless of background and experience. It’s for anyone wanting to participate in fun weekend activities, school holiday day camps and even progress to competitions without ever needing to own a pony. Plus, it really is more than just riding. Just being around horses is great for a child’s self-confidence and it’s a great opportunity for them to create new like-minded, life-long friends. It’s educational and very progressive; all members receive instruction and feedback and could potentially go from beginner to competent rider with a very reasonable amount of tuition. 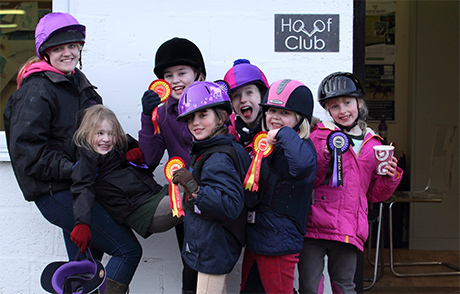 Located at Rein and Shine, just ten minutes from Junction 16 of the M4, Hoof Club CIC is open to 4 to 16 year olds and is split into half-pint, junior and senior groups. Current members already come from a 50-mile radius of North-Wiltshire. And it doesn’t end there, Hoof Club can carry on past 16 with an adult stable management course and Hoof Club Jumping and Dressage Teams are open to adults; the eldest team member is 72 so it really is a sport for life! Hoof Club also caters for schools with Special Educational Needs children, giving them the chance to experience the wonderful benefits of equine learning needs. The facility has already become a cornerstone for the Special Educational Needs (SEN) community and can offer immediate free taster sessions to SEN/D departments of schools and colleges. For more details please contact Rein & Shine via the details below.